← A Sneak Peak Into My Pumpkin Carving Toolbox – PLUS! Stay Tuned Tomorrow for Some Exciting News! Time to get your pumpkin carving tools ready! 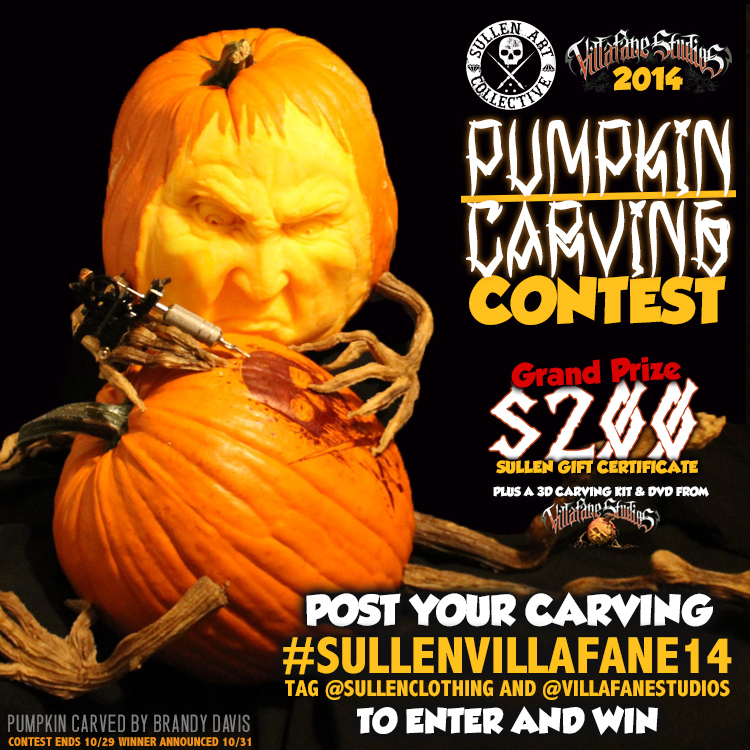 If you are looking for a challenge this Halloween season, then the 2014 Sullen/Villafane Pumpkin Carving Contest is looking for YOU! First prize is a $200 gift certificate to Sullen Clothing, and a 3D carving kit and DVD from Villafane Studios! It’s an online pumpkin carving contest, so if you have a phone/camera and you are reading my blog (a.k.a. you have internet access), then you have no excuses! For those that do not know, I was the winner of the very first Sullen/Villafane pumpkin carving contest back in 2012 and my artistic life has been a (good) roller coaster ride ever since. I am very thankful that there are companies and established artists out there who collaborate to put on events like this. They give other artists opportunities to showcase their work (and to have fun while doing it! ), which, in turn, can create even more opportunities for the artists who are entering the contest. This pumpkin gave me a ton of problems from the start – it was heavier than heck, but the wall of the pumpkin was very thin – I ended up not being able to carve the features as deep as I would have liked, which meant the pumpkin ended up looking different than I had originally planned. BUT, nevertheless, it’ll do. Sullen Clothing also lent me one of their personal brands of tattoo machine to use as a prop for the photo. The vine arms and legs are courtesy of Villafane Studios. The props really make the pumpkin scene come alive! That logo is hand-drawn and took hours because of all the tiny, tiny details. I also left part of it unfinished to make it look like a “work-in-progress” by the tattoo artist. Anyhow, I hope you like my latest 3D pumpkin creation! And even better, I really hope you enter in the pumpkin carving contest! As always, if you’re not sure what tools you need, check out my post where I give my 3D pumpkin carving tool recommendations for beginners. As for the rest of you – stop reading, and get carving! This entry was posted in Pumpkins and tagged 2014, 3D pumpkin carving, 3D Pumpkin sculpting, contest, logo, pumpkin carving, pumpkin carving contest 2014, sullen, tattoo pumpkin tattoo artist, villafane, vine arms and legs. Bookmark the permalink.